Domaine Pinnacle in all its autumn colors. A number of autumns ago I spent time in Quebec's Eastern Townships (Cantons de l'Est), and what a beautiful season to be in this part of Canada. The leaves are changing, there's a hint of wood smoke in the air, and it's a fine time to bundle up and go for a walk and soak up the fading sun. This is the province's agritourism and wine growing region, and the Wine Route (Las Route des Vins) links 16 wineries and nine communities along the 140 km (80 mile) trail. It's also an area of holiday resorts, cozy inns and charming villages. And yes, fabulous cuisine. Domaine Pinnacle was my first stop, owned by Susan and Charles Crawford. 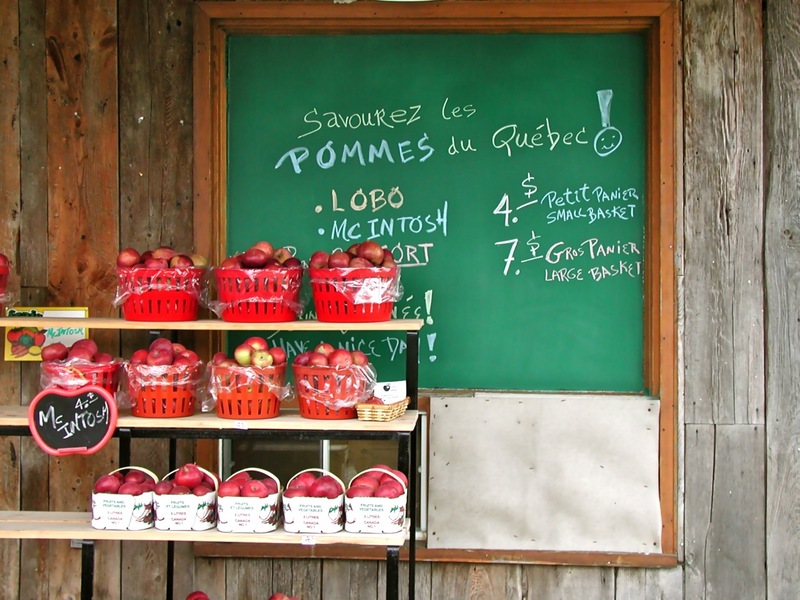 The 430-acre apple orchard and cidery is located on the southern slopes of Pinnacle Mountain near the historic village of Frelighsburg, one of 35 Most Beautiful Villages of Quebec. 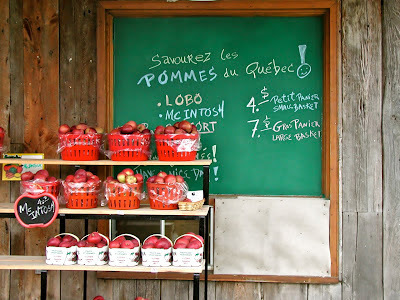 With its location on the 45th parallel, plus sunny summers and icy cold winters, it's well suited for apple production. The first sparkling ice cider in the world was launched here. Cidrerie Fleurs de pommier is now Union Libre. Nearby in Dunham is Union Libre, a 75-acre estate that produces fire ciders, ice ciders and sparkling ciders. Formerly home to Cidrerie Fleurs de pommiers, the estate was purchased in 2010 by four young professionals: Martine St-Onge, Remi Fillion, Anouschka Bouchard and Francois Busque. They are producing cider and wine "that evokes the union of knowledge and the freedom of the senses in order to create unique aroms, flavors and textures in a spirit of creative freedom." Hence the name, Union Libre! Wine will be available in 2013, and a number of guided tours with tastings are offered for a nominal fee. 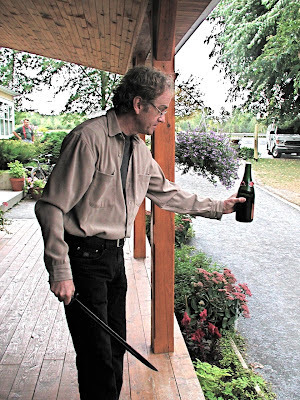 Sabering a bottle of sparkly at Vignoble de l'Orpailleur! Another vineyard, Vignoble de l'Orpailleur, was established in 1982. Two of the main varieties of grapes include Marechal Foch and Chancellor, and many of the vines are 30 years old. In fact, it's the oldest vineyard in Quebec. On site are wine tasting, wine tours and The Corkscrew, a seasonal restaurant. The ECONOMUSEE (Economuseum) of vines and wine includes artifacts from the past and the history of wine via the winemaker, harvesting and production techniques. 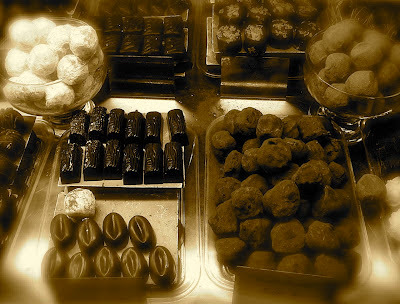 Chocolates at Musee du chocolate. For a sweet stop, don't miss the Musee du chocolat in Bromont. Michael Bilodeau and Serge Bedard opened a chocolate making business in 1986, and eight years later they added a chocolate museum. There's also a small resto on site. 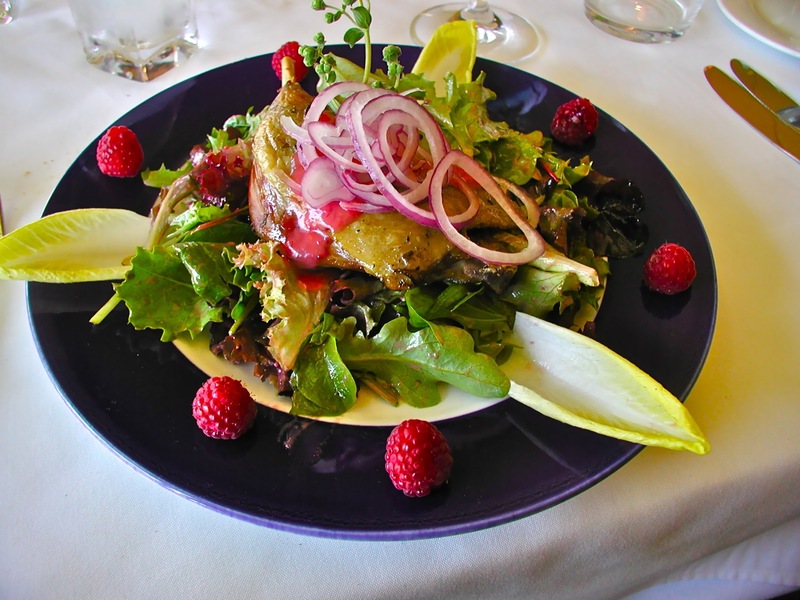 Duck leg confit salad at Auberge Quilliams. For lunch, Auberge Quilliams is a lovely spot. It's located on Brome Lake near the village of Knowlton, in a hotel/spa complex. The restaurant also serves dinner, and outdoor activities include private access to the Quilliams Wildlife Reserve (they offer a two-hour marsh exploration by canoe or kayak) and an outdoor pool and private beach on the lake for guests. Manoir Hovey is a member of Relaix & Chateaux. 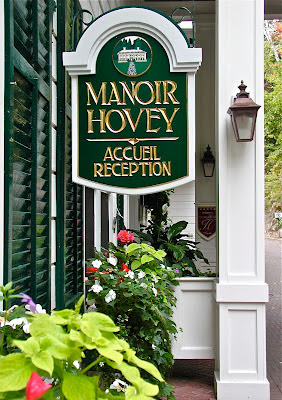 I stayed at Manoir Hovey (Hovey Manor) in North Hatley, where I had a cozy room in a tranquil setting. Located 75 minutes east of Montreal, it's on the shores of Lake Massawippi. Looking a lot like George Washington's Mount Vernon home, it turns out that it was built as a private estate modeled after the the first US President's home. Since 1950, it has been a resort inn and is a member of Relais & Chateaux. 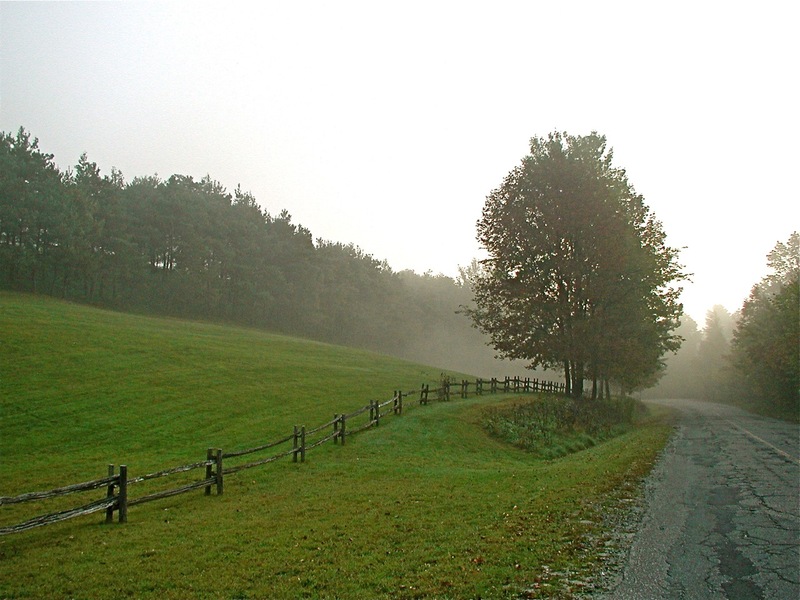 North Hatley is a popular summer colony for Americans, located just 20 minutes north of Vermont. Lots of walking and hiking at Mont Orford. After cocktails in Manoir Hovey's Tap Room Pub and a leisurely dinner in Le Hatley Restaurant (don't miss the cheese cart, touted as the largest in the province), I turned in for the evening. Following breakfast the next morning, it was on to Magog to explore the villages boutiques and have a bite to eat. 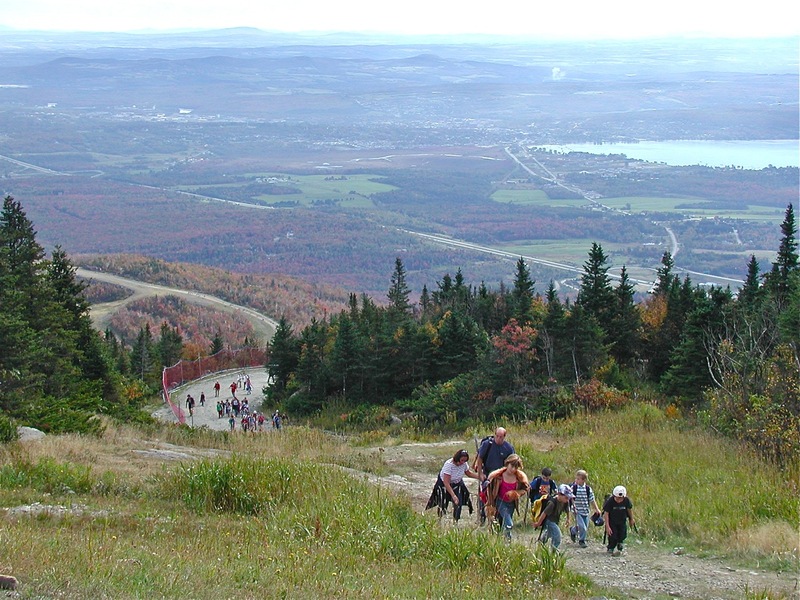 Nearby is the Mont Orford resort, a scenic locale with miles of walking and hiking trails, accessible by gondola. In winter, it transforms into a popular ski area. Stanstead's claim to fame is its location on the Canada-United States border across from Derby Line, Vermont. The Haskell Free Library and Opera House, built between 1901-1904, is unique since library patrons from either side of the border may enter the building without passing through customs. The international boundary is marked with a black line across the floor (a popular place for picture posing!). The entrance and half of the reading room are in the US, whle the other half of the reading room and all of the books are on the Canadian side. The border runs through the Haskell Free Library. The situation is the same in the Opera House upstairs. The stage is in Canada, but the majority of seats are in the US! In addition to its unique location, the building is known for its architecture and lavish interiors. The Library has a collection of 20,000 books plus a French-language section with another 4,500 volumes. Original curtains, sets and props designed and painted by Boston scenery painter Erwin LaMoss in 1902 are still intact in the Opera House. They are the last of his works known to survive. Autumn morning in North Hatley, Quebec.